Way back in 1999, I landed a job that offered excellent medical benefits with one hitch: no dental coverage until after the first year. Perhaps I could go without dental benefits for one year? It seemed a calculated risk worth taking, my then-husband and I thought. We were enrolled in his medical plan, paying almost $100 a month out of pocket. (Goodness that sounds cheap in 2017.) It included dental coverage, but the monthly contribution took too big a bite out of our very limited budget. The choice seemed clear: We would sign up for the free medical coverage at my new job. We would both schedule dental appointments right before our coverage ran out, and then cross our fingers and hope for the best for the next 12 months. Then, a few months later, it happened: a nagging pain in one of my molars that continued to worsen over five days. A trip to a dentist friend confirmed my suspicion. I needed a root canal–and quick. Aware that I lacked insurance, my dentist offered a 15% courtesy discount, slicing the cost of the one-hour procedure to a still-hefty $500. But the pain in my tooth was worse than the pain to my pocketbook. I knew I had to do something. I underwent the root canal, parted with my money, then discovered later that the surgery was just the beginning. I would need a crown to protect the now-brittle tooth at an additional cost of $700, even with a discount. And I had several cavities that needed to be filled, at $90 each. There had to be a better way, I decided–or at least a cheaper one. A co-worker tipped me off to the UCLA dental school clinic, which provides full dental care to patients for about half of a practicing dentist’s fees. The student work was supervised by dental school faculty. Not everyone can get in: Patients were pre-screened to ensure that their dental needs match the school’s educational needs. Once accepted, patients paid $89 for a comprehensive exam, cleaning, and a full set of X-rays. Then patients were treated for correcting their dental problems. A filling had cost between $40 and $65; a root canal between $215 and $330. A crown had cost from $275 to $335. It was a good deal for patients, but there were some trade-offs. Appointments at the dental school clinic lasted three hours, and were sometimes devoted to a single procedure, such as a teeth cleaning or a cavity filling. The lengthy appointments were made to accommodate the students’ busy schedules, and the clinic was closed during school breaks and exams. As I waited for my initial cleaning appointment–the first step to getting my half-price crown–I got an offer I couldn’t refuse. Was I willing to be a test subject in a state dental board exam? I would get the crown and a filling for free, while also doing my part to advance the field of dentistry. 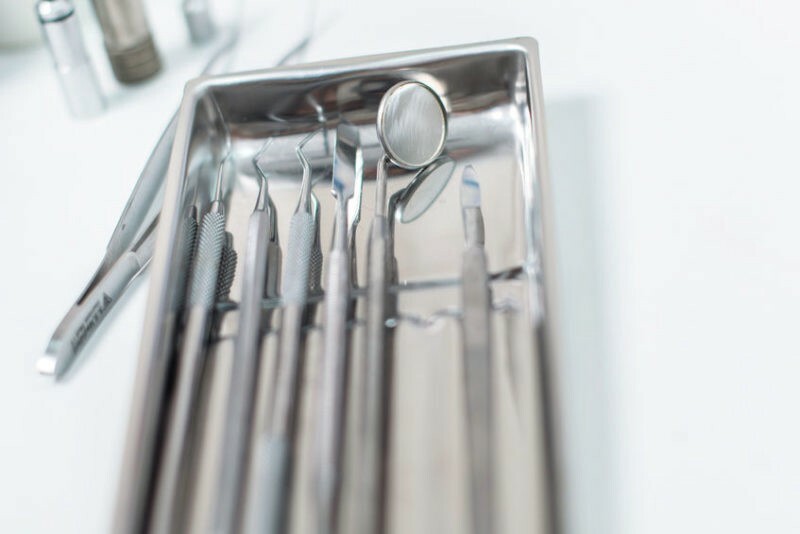 To become a licensed dentist in California, students needed to pass a tough written and clinical exam–the latter of which involves cleaning teeth, putting on a crown and filling a cavity, all under the watchful eyes of state dental examiners. Because I needed a crown and had five cavities to fill, I was a great candidate for the dental hopefuls. Despite having lost the chance for a free crown, I decided to proceed as a guinea pig. By now I wanted to help and, heck, a free filling was nothing to sneeze at. On exam day, I cleared four hours out of my schedule to be available for the test. I arrived early, signed a few waivers and headed upstairs to wait in the hallway outside the large exam room with my anxious dental student and his assistant. The dental students seemed nervous as we waited for the exam to begin. Failure would be costly, and not just to their pride. Beyond the years of studying and thousands of dollars in student loans, the prospective dentists have shelled out $600 to take the exam and an additional $500 to pay the assistant. My dental team started to work immediately, numbing my mouth and swiftly installing a “dental dam” in my mouth. The dam was basically a piece of metal propping my jaw open, and a rubber sheet isolating my teeth from my tongue. He drilled an opening and cleared out the decay. A portion of the freshly drilled tooth chipped away, and the assistant rushed off to find a supervisor for consultation. The white-coated, poker-faced referee deemed the chip unavoidable, and directed my dentist to correct the problem. Two hours later, I was sent on my way with a new filling. I left without knowing whether my dental student passed his exam. (I later found out he did.) While the price was right for my new filling, the three-hour ordeal left me with a “sprained” jaw, restricting me to a soft-food diet for several weeks and delaying my other dental work for several months. But discomfort aside, I was satisfied with the experience–and my free filling. When my dental insurance finally kicked a few months later, I decided to go back to seeing a private dentist. It was a decision based on convenience more than anything. But even with the safety net of insurance safely in place, it is still nice to know that quality dental care at a reduced cost is there if I ever need it again. Originally published in the Los Angeles Times on January 4, 1999.